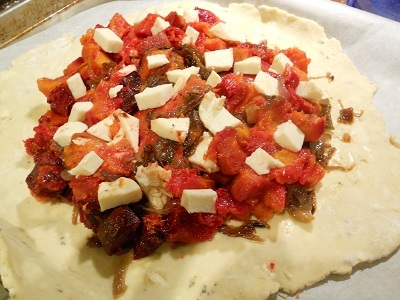 I think I’ve just committed the most egregious example of this mistake with this savory tart filled with roasted vegetables, caramelized onions and smoked mozzarella. I had no plans to make this, nor blog about it. Nope, had no dreams about how well the sweetness of the onions would bounce off the smoky cheese that had melted in between the layers autumn vegetables that had been wrapped in a savory, flakey crust. Nope, not a thought. What I had planned on taking a picture of was the butternut squash. Not because I wanted to do anything with it for the blog, but because I wanted to document its size. It was the largest squash I’d ever seen — my guess is one and a half feet high and about 15 pounds. It was roughly as tall as my cat, but clearly outweighed him by five or so pounds. I had wanted to photograph the cat standing next to the squash, but I totally forgot to do it until I had cut off the top of the squash on Sunday night in order to whip together some butternut squash risotto. After I had cleaned and cubed the chunk of squash – there is still a chunk of squash in the fridge that hasn’t been touched, about the size of a regular butternut squash – I realized I had way too much squash on hand. So I decided to roast the leftover squash, and while I was at it, I might as well toss in some other roots I had hanging around my crisper. So out came some beets, a few carrots, and a handful of red potatoes from the cupboard. 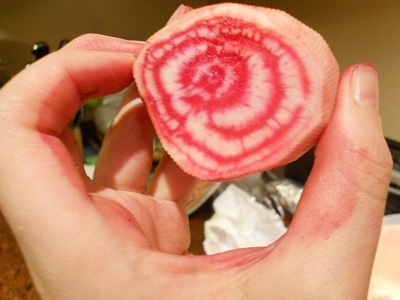 I did call Rich in at one point to take a photo of the striped Chioggia beet because I was so taken by its beauty. Can you believe this came out of dirt? I asked him. So I peeled and cubed my root veggies, tossed them altogether in a bowl with a few glugs of olive oil and a healthy pinch (make that two pinches) of salt, and dumped it all in a large lasagna pan. I decided at the last minute to lay down a few sprigs of thyme on top. My goodness, I said to myself, all those colors, it’s as pretty as a picture. I then covered it with foil, and tossed the pan into a 400 degree oven. I know, ridiculous, right? To see it, say it, and then do nothing about it. So silly! About 20 minutes in, I checked the veggies, gave them a stir, and then 25 minutes after that, I removed the foil, gave everything a stir, turned the oven down to 350, and baked them for about 15 minutes more. I then removed the pan from the oven, admired how all the pinks and oranges looked like a sunset, and then taste-tested a few of the different veggies to make sure they had all softened sufficiently. Once they cooled, I moved them to some Tupperware and put them in the fridge. 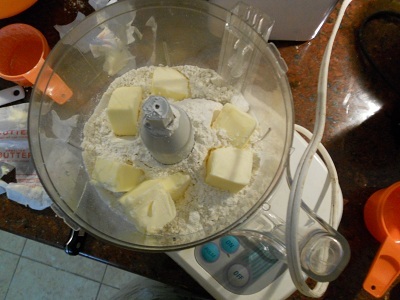 This next part is something that I often grapple with on this blog: using ingredients that aren’t exactly inexpensive. Last week I was poking around the cheese case at the market around the block when I stumbled upon a very nice hunk of smoked mozzarella. It was some sort of Manager’s Special that day, and was discounted $3. I bought the cheese – I mean, wouldn’t you? – but figured I wouldn’t mention it on the blog because I couldn’t very well go and expect people to go and buy a pricey bit of cheese for something, even though I bought it at a discount. So, I was sitting at my desk at work thinking about my ball of cheese and my roasted vegetables when it occurred to me that those two things might taste very good together. But I didn’t want to mash them into a sort of hash and put them in a pie dish and melt the cheese on top. And that’s when it dawned on me: this would be the perfect opportunity to try out a savory version of Jacques Pepin’s apple galette with some fresh herbs added to the dough. And, I asked myself, wouldn’t the tart be so much better if some caramelized onions were involved? And that’s when I kicked myself for not photographing my roasted root veggie prep. I did not know any of it was going to end up on Cheap Beets, but now it has, if but with a truncated version of the photography. Sure, some of you might take note that this is the third version of some sort of rustic tart on my blog – in a row, no less. Some of you might even call it cheating. But I don’t think you’ll really mind. 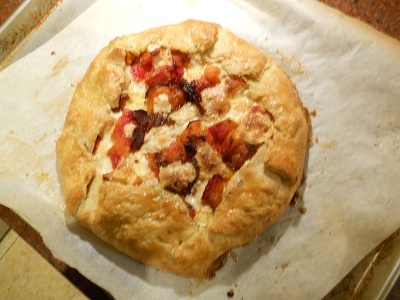 Rustic Roasted Root Vegetable Tart with Caramelized Onions and Smoked Mozzarella. 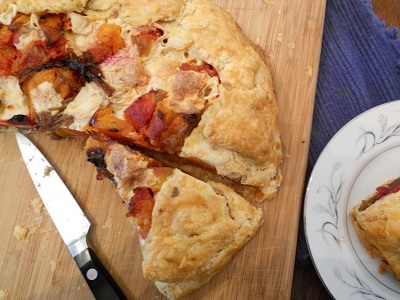 This is four separate recipes in one, just as the roasted pear and cranberry crostata was. I followed my own advice this time and made each part on a different night. Of course, I hadn’t actually planned it that way, but tarts really are what happen to you while you’re busy making other plans. Part One: Roast approximately three cups of root vegetables – I suggest butternut squash, beets, carrots and potatoes – according to the description above. 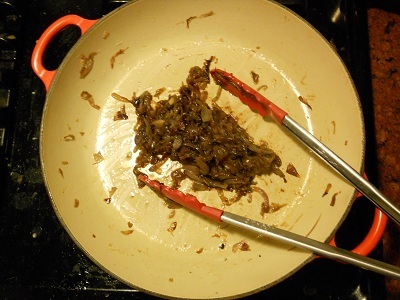 Place the onions in a deep 4-quart saucepan and drizzle and toss with olive oil to coat, about ¼ cup. Set over medium heat and, shimmying the pan occasionally, cook until the onions are slightly golden on the edges. Stir occasionally – it might take as long as 25 minutes of slow, slow cooking — then stir in a few pinches of salt. Stew, stirring occasionally, until the onions are amber colored and tender but not mushy, another 20 minutes or so. If at any point the onions look as if they may dry out, cover them to trap some of the moisture in the pan. Taste for salt. You should get about 1 cup cooked onions. All of the previous ingredients can be made beforehand and refrigerated for approximately three days. Preheat the oven to 400°. 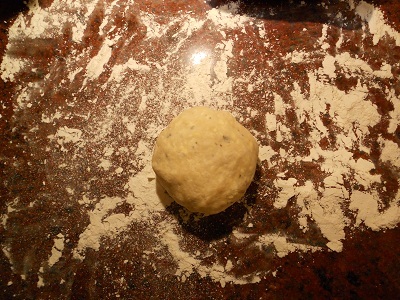 On a lightly floured work surface, roll out the pastry to a circle and transfer to a large rimmed baking sheet. 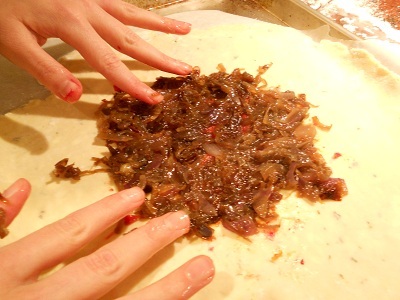 In the center of the pastry, lay out all but one quarter of the caramelized onions. Lay two thirds of the mozzarella on top of the onions. Using a spoon, gently place all of the root veggies on top of the cheese. Distribute the remaining onions and pieces of cheese on top of the vegetables. 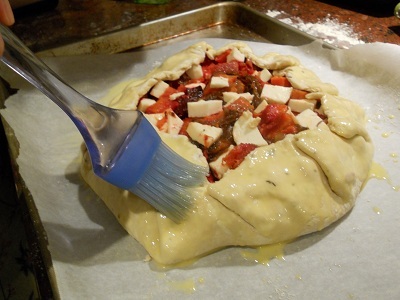 Fold the pastry edge up and over the vegetables to create a 2-inch border. Brush the folds of the crust with the beaten egg. Bake the tart for about 1 hour, until the pastry is nicely browned and crisp. Transfer the pan to a rack and let the tart cool. Serve warm or at room temperature. For nearly half a year, I’ve been searching for the disc stem for my food processor. It’s in my kitchen, somewhere. I have this vague memory of me removing the stem from the disc and the processor and saying to myself, oh, I’ll just put this right here so I won’t lose it. But now I don’t know where that place was. My friend Mike is a neuroscientist, and he hypnotizes patients for his sleep studies. I’ve asked him to hypnotize me to that moment in time when I was last with my stem. He says he’ll do it, but there’s a 50% chance he’ll make me squawk like a chicken instead. I don’t know if I can take that risk. I’ve opened drawers and cupboards, stood on ladders, and peered into pots. Nothing. Last week, I made my friend Ben, who towers over everyone in the room at 6’5”, search the kitchen. I figured, given his bird’s eye view of the world, he could see things I cannot. He spent 45 minutes in my kitchen. Still no luck. The funny thing is, I didn’t even know I was in the market for a food processor when I found out I needed one. The fall after my college graduation, my boyfriend at the time and I were given the task of making the stuffing for his family’s Thanksgiving dinner. I called my mom for a recipe. “Step 1,” she said, “get out your food processor.” “But Mom,” I said, “I don’t have a food processor.” “Step 1: go to Macy’s and buy a food processor.” Off to 34th Street I went, and I have to admit, shoving two bags of celery stalks and carrots down the chute and through the grater made my life much easier. The machine has helped me whip up countless pestos, a dead simple romesco sauce I really need to post at some point, dips, and piles of perfect bread crumbs. Heck, even Alice Waters, who abhors all sorts of things electric, has a food processor. 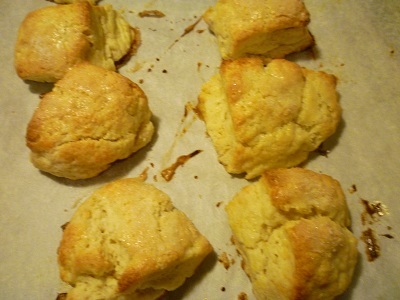 This summer, before I knew the predicament I was in, I made these biscuits. They were perfect. But now we’re in November, I’ve got stuffing on my mind, and as I pointed out to Rich as I was turning over the kitchen looking for the stem yet again, I’m on a Chanukah countdown. He assures me that he will grate every potato, or onion, or parsnip, or sweet potato, or zucchini that I see fit to be fried in oil and deemed a latke, but I still want to find the missing piece. 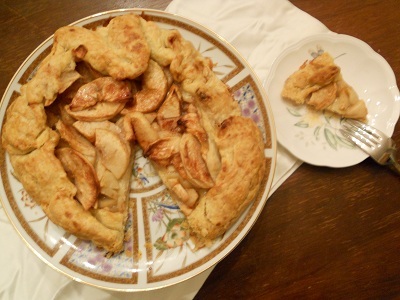 I am relieved that although I cannot find the stem for the grater to my food processor, I can still make this apple galette recipe by Jacques Pepin. 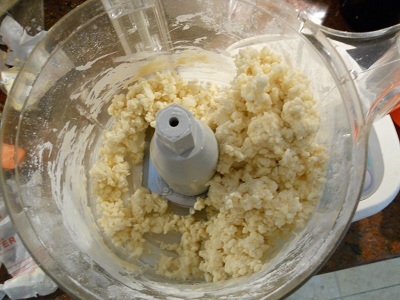 In a food processor, it takes about 15 seconds. It’s the easiest dough recipe I’ve ever used, even easier than the Dutch apple cake, and is up there as one of the most delicious things I’ve ever baked. Since it’s a Jacques Pepin recipe, you know it’s going to be perfect. It’s such an easy recipe, in fact, that the first time I made it, I whipped up the dough and stuck it in the fridge (it’s one of those recipes where you have to put the dough in the fridge for a bit), and had Rich take it the rest of the way. He did. It was perfect. Weeks later, after I raved to someone else about the perfect galette, Rich whispered to me that he didn’t even follow the directions about decoratively arranging the apples into concentric circles. “I just kind of dumped it in the middle.” Inelegant? Yes. Perfectly delicious? Yes. Dead simple? Yes. The dough can surround either fruits or veggies; there is so little sugar in this recipe – just a little more than a teaspoon – that I often toy with the idea of making a savory filling, maybe adding a little sage to the dough. I haven’t yet tried that, so if anyone does, I’d love to hear about the results. In the meantime, I’ll use up more of my CSA apples, and do a few more go-arounds of my kitchen in search of my disc stem. 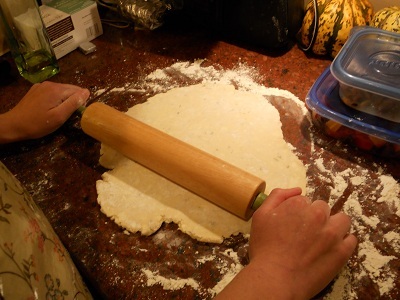 Because the pastry is free-form, it can be rolled into a circle or rectangle. Don’t worry if it’s not perfectly shaped; there’s a rustic quality to this dish which makes an uneven galette even more charming. Pepin suggests serving this as a buffet offering, slicing it into pizza-style slices to be eaten standing up. PREPARE THE TOPPING Peel, halve and core the apples and slice them crosswise 1/4 inch thick. Set aside the larger center slices and coarsely chop the end slices and any broken ones; about half of the slices should be chopped. In a small bowl, combine the sugar and cinnamon. Make Ahead: The buttery pastry can be refrigerated overnight.